Revitalization • Miller family to build a 10-screen, 2,300-seat complex  complete with an IMAX screen. (Courtesy Howard Hughes Corp.) This artist's rendering shows a central gathering area in the open-air, 57-acre Cottonwood development. 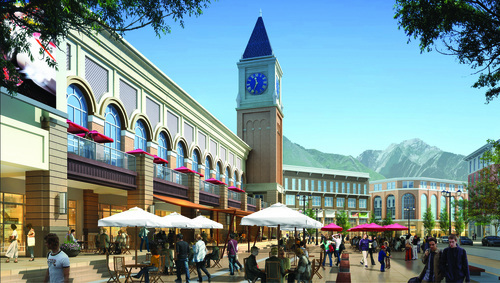 The building dominated by the clock tower will be home to a 10-screen, 2,300-seat Larry H. Miller Megaplex Theatres complex once the property owner, Howard Hughes Corp., redevelops the dormant mall site. 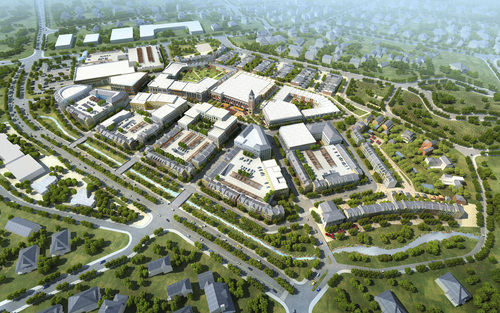 (Courtesy Howard Hughes Corp.) In this aerial rendition of the new open-air development at the Cottonwood Mall, a 10-screen Larry H. Miller Megaplex Theatres complex will occupy a central building topped with a tower. Smith's Food and Drug previously made a commitment to open a grocery store at the 57-acre development, which will feature a long-isolated Macy's store as its northern anchor and a housing complex holding down its southern end. Holladay Mayor Rob Dahle&apos;s expectations are building that the old Cottonwood Mall site will be revitalized soon. Fueling his optimism is a recent commitment by Larry H. Miller Megaplex Theatres to establish a 10-screen, 2,300-seat complex  complete with an IMAX screen  in the 57-acre mixed-used project being redeveloped by Howard Hughes Corp. The Miller family&apos;s decision to become part of the Holladay project follows the June disclosure that Smith&apos;s Food and Drug had signed a letter of intent to build a 78,000-square-foot grocery store adjacent to Macy&apos;s department store, the lone occupant of the property since the mall was torn down in 2008. "All indications are that the project is moving forward rapidly," Dahle said Wednesday, buoyant that two prominent Utah business names  Miller and Smith  are behind a project so vital to Holladay. "This isn&apos;t just about [building] our tax base," said the first-term mayor. "It&apos;s about trying to create a vision for the city and a place for our residents where they can go to eat and recreate. "You want restaurants. You want theaters. You want a grocery store and, in the future, a gym on site," he added. "That&apos;s what makes it a full mixed-use development, where you have people working and playing." Getting Smith&apos;s parent company, Kroger, to commit to the site was crucial to the mixed-use concept, Dahle said. The developer needed a grocery store to entice people to move into upscale housing units contemplated for the property&apos;s southern end. Now Dahle is just waiting for Hughes Corp. to announce it has found a partner to develop those housing units and to break ground for the project, on hold since the Great Recession upended General Growth Properties&apos; plans and sent the company into bankruptcy. Hughes Corp. emerged in 2010 from General Growth&apos;s Chapter 11 reorganization to run its master-planned communities and mixed-use projects, including Cottonwood. "The Megaplex will be part of a dynamic lineup of retail, dining and entertainment that will be an exceptional part of the Cottonwood transformation," said Hughes Corp. President Grant Herlitz. Megaplex Theatres President Blake Anderson said the complex will have advanced digital projection and audio systems, ticket kiosks and reserved stadium seating. It also will have a full-service dining hall offering visitors a variety of food and drink options while watching movies, he added. Megaplex officials were interested in the Cottonwood Mall site because Holladay already has a well-established population base that will increase with the project&apos;s housing component, said spokesman Jeff Whipple. "We look at population trends when determining how and when we construct a new Megaplex," he said. "We have a substantial interest in that property being brought into being a commercial and mixed-use opportunity."